Scroll down for the Steamboats.com online museum model boat section, scroll down (or click here) for more model boat information and links. 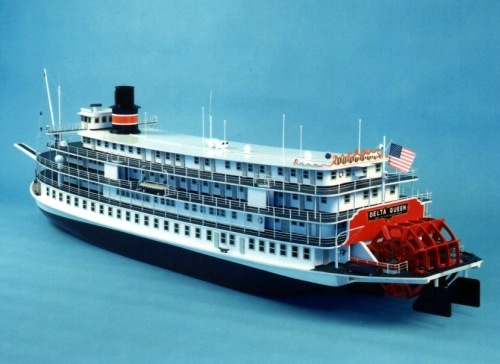 Delta Queen model by Bill Johnk, completed in 2014. Fryant Model Boat Exhibit Photos of model boats built by John L. Fryant. He also sells a catalog of plans (click here). 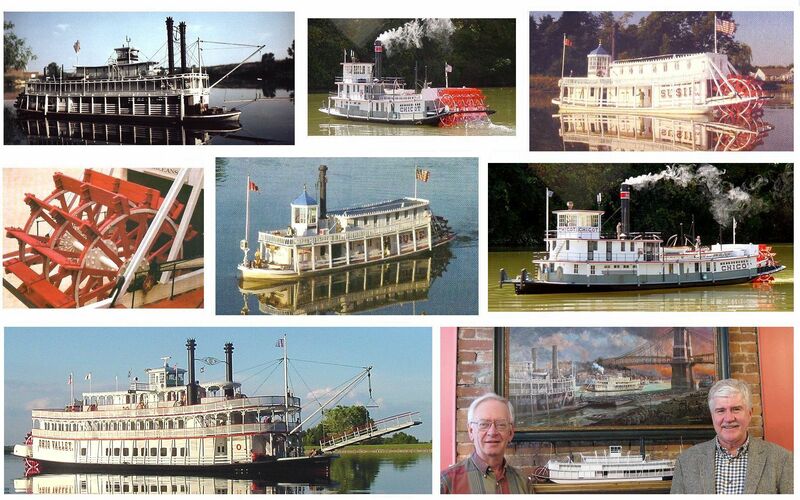 Delta Queen Steamboat Model Restored - John Fryant see the restored model and learn something of what went into restoring it. Far West Article and photos of a Missouri River Mountain Boat model, by Peter Russell. Detail photos of a magnificent hand-made model boat by Ronald Simmons. This boat is for sale. J.M. White model in progress. Read up on the Fred Aeschbacher model collection and the "Fulton's Followers" Group at Google, and see more model boats on display. Three model boats by Virgil Reynolds: the Delta Queen, Henry L. Hillman, and River Rose. Boats and model kits by the late Dwight Hartman, of Hartman Fiberglass Models. Photos of a model built by Randy Decker, including large detail jpgs. Photos of a model built by Frederick Aeschbacher, including large detail jpgs. A new model built by Bernd Mueller. A radio-controlled model built by Jim Hale and an article by Jim Hale about how he built it. 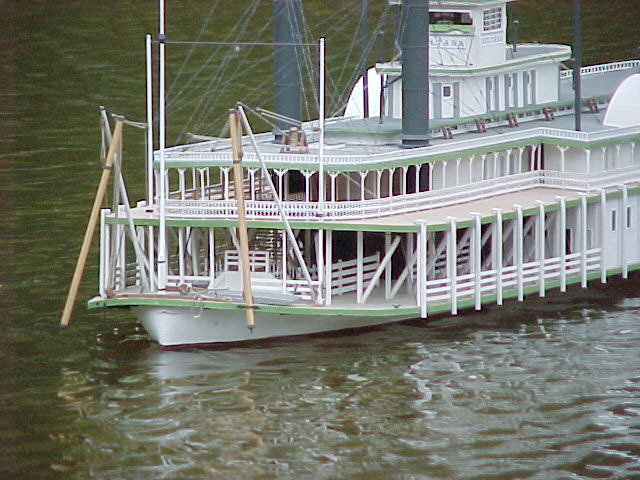 Twelve photos of radio controlled steamboat models, crafted by Ralph Lossing. A fun idea: buy a radio controlled boat, car, or plane! John collected these plans over many years. Many come from Ward Engineering Works of Charleston, W. VA. The catalog includes a resource section on how to collect boat plans and where to find them. Also, resources for historical societies, publications, and model building supplies. If you are a ship model builder, river artist, historian or just a boat buff, you will find this catalog useful. Shown below is a small sampling of John Fryant's model-making expertise assembled by Dave Thomson. Photos of the CHAPERON, SUSIE, CHICOT and OHIO VALLEY - RC models on the water. 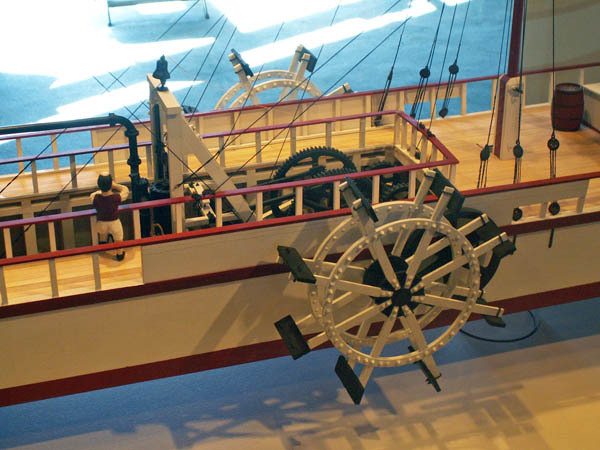 Center left is a detail of the sternwheel of the SUSIE. Bottom right is John Fryant (left) with a reference model of the QUEEN CITY on the mantle that he made for artist Michael Blaser (right) whose giclee of his painting of the QUEEN CITY at Cincinnati hangs above the mantle in John's home in Maineville, Ohio. To see more, go to: Fryant Model Boat Exhibit. Boat Modeling - with Harold "Dynamite" Payson. "A Step-by-Step Guide to Building Models of Small Craft. Ships of Scale by Donnie Driskell - "Building ship models, especially the wooden kind, is an art, and requires learning a new talent and even a new language of the ships parts and components. The manuals, instruction, and plans are all written expecting the ship modeler to already have some foundation knowledge of nautical terms." blog.RemotorBoater.com Website about RC Boats where I talk a good bit about the electronic components and how to improve performance of your boat. I thought your readers might enjoy some of my articles and tutorials on things like Lithium Ion batteries, hacking Gas engines and RC Boat basics, by Matt Ward. Radio Control Boats go directly to the r-c boat section at xenonproject.com, your friendly one r/c store, also sells boat model parts and buiding supplies. This is a real place with real people, so tell them Nori at steamboats.com sent you! Send me an r-c boat if you have an extra one!! Demo Co. of Hong Kong sells model boat components. Hms Surprise Ship Models Browse a wide range of model ships, sailboats and yachts available at reduced prices. Available in different sizes. This is a Delta Queen radio controlled model boat found recently at the rcgroups.com forums. Rapid Prototyping DPT Fast Rapid Prototype Stereolithography - for model builders - a rapid prototyping company concerning stereolithography (SLA), selective laser sintering (SLS), injection molding, urethane casting and fused deposition modeling (FDM). We work with thermoplastics, epoxy, nylon, urethane, and many different metals to bring 3d CAD files to reality. Continuous research of the different areas of engineering brought me to steamboats.com; it stands out as one of the few credible resources covering similar engineering facets. Buzz's Boat Yard one of the largest toy boat and ship sites on the web. Buy or sell a boat here. Steam Models from Yesteryear Toys and Books Inc. "Fascinating Working Steam Models!" Kits or assembled. Advice from Jim Vetack on using a 3D printer in model building: "I can use software and my cell phone and take pictures (360 degrees) around and object or a person and covert that into a 3D model in my computer and then print it out on my printer. So you can do this with the actual captain of a steamboat and put him into your model (reference Autodesk 123D software - it's free) I can print parts out in wood filaments, metal filaments (bronze, silver, brass) that can be sanded, polished, stained and painted. This would be great for bells, whistles many things. When I build model kits if I lose a peace or break a peace I just draw it up and print it out. Certainly there are scale limitation but DPL 3D printing with resin can amek some pretty small peaces." Here's a company he recommends: Here is a link to a 3D printing site that shows how accurate you can print people, it is really cool. Expand this method if you need exact scale copies of boat parts etc.doob3d.com. The site shows examples of how realistically they can print people, too.